The Future-Proof Loyalty Program just completed its first year. Why are we excited? And more importantly, why should you be excited? The short answer is that in 12 months, the Future-Proof Loyalty program has matured into a comprehensive customer experience program spanning a rich set of IT infrastructure products including primary storage, unstructured storage, data protection and hyper-converged infrastructure. And the program’s benefit pillars include technical capabilities, financial options and support offerings, with an eye to a world where customers desire peaceful coexistence between on-premises and off-premises infrastructure (i.e. hybrid/multi-cloud). For us, the big news is the innovations we’ve encapsulated to support one of Dell Technologies’ primary corporate goals – customer satisfaction. We’ve been able to take powerful concepts – satisfaction guaranteed, investment protection, and timeless technology – and make them part of the purchase experience across Dell EMC. For you, the big news is with 13 product families, across three of our product lines, we offer nine benefit pillars, many of which contain multiple features like our multi-faceted Cloud Consumption and Cloud Enabled pillars. And industry analysts IDC and ESG agree with you – customer experience programs like Future-Proof are becoming the new way to decide between IT vendors. All of this is because the world has changed. Planning for new technologies requires conversations about a path forward. Relentless budget pressure makes planning support costs and operating expense (opex) financial models important to businesses of all sizes. And the more data we humans create, the more critical that data becomes, so it’s ever more important that your vendors stand behind the promises they make about their products that handle your data. This means that the ‘old’ business behaviors just won’t cut it. And vendors realize what you want and respond. The Dell EMC innovation in Future-Proof is two-fold. First, we looked at our business practices to determine where we were already providing this value to you and second, we created new offers to meet additional needs and filled the gaps. And then in Q4 of 2017, the Future-Proof Loyalty Program was born. 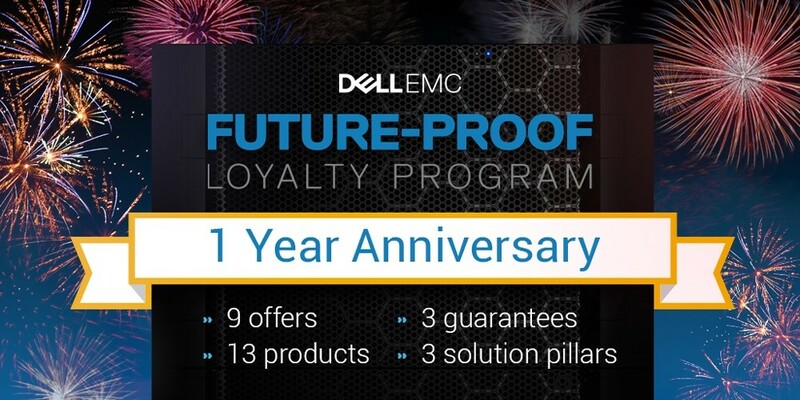 It started as the Future-Proof Storage Loyalty Program, with our Dell EMC Unity and SC Series midrange storage products. And we had only five benefit pillars to address the hottest issues in that market segment. Quickly after Future-Proof’s release, we learned that customers across our portfolio desired the same reassuring benefits. Customers everywhere value a transparent, more understandable purchase experience. And with the addition of new products came new offers, such as the deduplication guarantee for data protection products. So, how much did our little baby grow up over the year? Well, it’s a good thing we’ve been adding those marks on the door frame to keep track. So there you have it — What started out as a way to make life simpler for users in a crowded midrange storage segment became a way to make almost everyone’s life simpler, and to enable IT infrastructure users to take advantage of the latest product technologies and financial innovations in a multi-cloud world. Need help simplifying a complex IT infrastructure decision? Visit dellemc.com/future-proof or contact your Dell EMC representative. 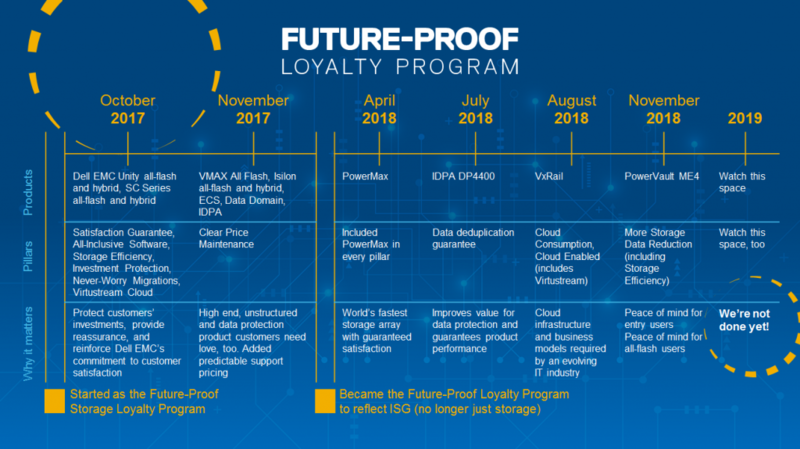 The Future-Proof Loyalty Program is a prime example that demonstrates how Dell Technologies’ size and resources, coupled with its cultural focus on supporting our customers, enabled us to create the most comprehensive loyalty program. With six iterations in 13 months, it’s a hectic pace for most anything in IT infrastructure. No one matches our breadth of products – many types of storage, data protection and hyper-converged infrastructure; no one matches our financial resources (check out Dell Financial Services); and no one matches Dell EMC’s customer support in reach and offerings. With Future-Proof, we’ve consolidated and organized the power of the all that is Dell Technologies and Dell EMC, to make it easier to make an IT infrastructure decision.